Managed IT Services is a set of best practices, processes, and tools that, when combined with technical knowledge and proper facilitation, delivers ideal results for businesses like yours. When you choose The Technology Squad and our IT Essentials services plan, you outsource your entire IT department for greater efficiency, a better end-user experience, and lower costs. Prepaid labor hours to have our expert technicians identify and resolve issues on site at your business as need be. Managed IT essentials Premium service is the Answer to. Did you know that cloud computing can boost employee productivity and protect your sensitive business data from being lost in emergency situations? Many progressive companies are implementing services through the cloud gain more than just mobility. Cloud-based solutions are shortening the technology gap between small and large companies as it enables users to leverage enterprise grade solutions at small business prices. 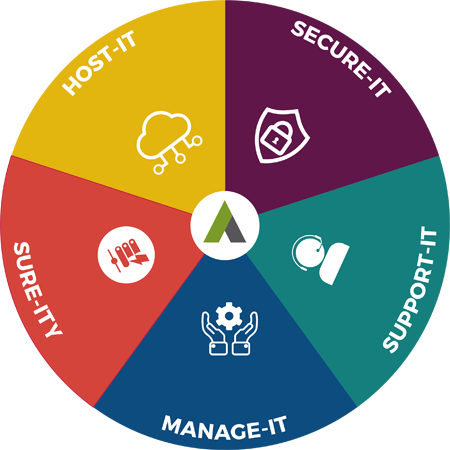 With managed local and cloud full and incremental backups for disaster recovery to recover part or all of your data plus business continuity for server infrastructure, you can enjoy the peace of mind that comes with knowing your data – down to each file and folder you choose – is regularly backed up and easily accessible through the cloud. At best, spam is annoying, and at worst, it can be downright dangerous for your business. By hosting your email and filtering unwanted spam and other incoming digital through the cloud, The Technology Squad IT can stop it from ever entering your staff’s inboxes in the first place. By hosting your servers and desktops with The Technology Squad IT through the cloud, you can benefit from reduced onsite hardware and increased backup capability. Instead of keeping costly and space-consuming servers on site, you can host them virtually through the cloud. By sharing your documents through the cloud, you gain far wider access and control over them from any configured workstation or device, without any loss of security. The Technology Squad IT can provide your business with file-sharing capability that allows your employees to collaborate, share and revise information with greater ease from any location. You’re likely using applications such as Microsoft Word, Microsoft Excel, and Microsoft Outlook, to get work done on a daily basis already. Now imagine how useful those apps would be when fully configured in the Cloud. The Technology Squad IT Direct is here to help you leverage Microsoft Office 365, featuring 99.9% uptime guaranteed, scalable services that fit your business, and provide you with a greater ability to collaborate and work remotely. Have you settled for generic IT support? The Technology Squad IT services a wide-range of small businesses, but we also further specialize in service offerings to those in specific industries. Through both experience and a mandate for tailored, client-specific service, we help businesses with a variety of focuses to get the most out of their IT systems and increase their productivity. Technology is a crucial asset in the high-speed environment of any hospital. Healthcare workers need the peace of mind that comes with effective IT to focus 100% of their time and energy on providing for patients. The Technology Squad IT ensures the best IT set up for healthcare practices to help expedite tasks and improve quality of care. Finance is one of most highly regulated industries in which compliance guidelines are continually updated and require companies to keep up. Whatever concern your particular business has with its IT system, our consultants can provide you with a custom designed solution to help you build your business and operate knowing that your data is safe and secure. It’s well known that IT is an expected part of modern business in any field – but for few is it as necessary as the legal industry. The Technology Squad IT offers services to help manage your caseload, expedite processes, increase productivity, and ensure that your clients’ sensitive data is always secure. We know how difficult it can be to develop IT infrastructure, processes and more when you’re just getting your business going. There’s so much to account for that IT can often be left by the wayside, leading to consequences and issues further down the line. While you’re getting your business off the ground, The Technology Squad IT can handle your foundational IT development for you so that your technology is prepared to support the first chapter of your new company. IT is an undeniably important consideration for businesses that intend to operate from multiple locations. Technology is crucial in keeping your many offices and employees connected and collaborating productively. So The Technology Squad managed IT services is built to help you with multi location connectivity, and communication, in addition to securely establishing connection between endpoints. We also help create hybrid cloud to any one of the major service providers either via VPN, or direct connection such as direct connect offered by AWS.